Unicorn style is back, ladies! Was it ever really gone? Probably not. But here’s one change: Now unicorn styles involve the actual horn. That’s right. And you can get unicorn horn manicures, just in case your inner Lisa Frank is seriously missing some unicorn action. First, there was unicorn horn hair. Then, there were unicorn horn-inspired beauty products. It only stands to reason that unicorn horn manis would follow! Unicorn horn manis feature one or more sculpted acrylic nails that look just like a unicorn horn. Check out these cool manis below. First of all, we don’t know what’s more magic: the stuffed animal or the nails! A single glittery nail can be magic. And these grown-up horns, too! How pretty are these pastel pink nails? And these cool blues, too. 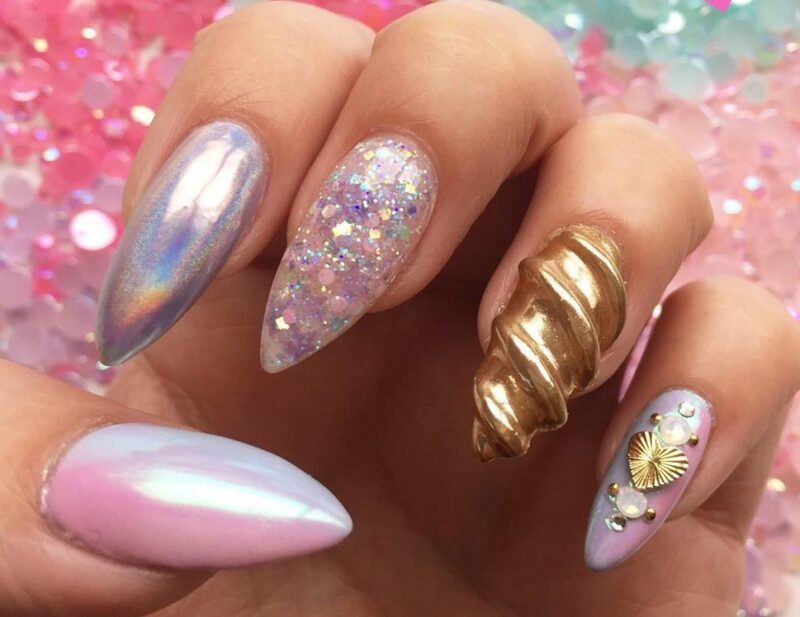 We spy another type of unicorn nail! Finally, we’re particularly enamored by the gold heart. Certainly, these nails aren’t completely practical. But hey, we only live once, right? Furthermore, we think our inner goddesses would completely agree with the necessity of these nails. They’re not just beautiful, they feel powerful, too. In conclusion, embrace your inner magic lover and get creating. And don’t forget the glitter!